Appleton rum is the proud production of Appleton Estate in Jamaica and it has quite an interesting history! During the English empire, it was discovered that the rum time spent in the barrel, combined with the gentle rocking of the ship allowed for a smoother, tastier product. We learnt that during the 2nd world war, whisky was in very short supply and experiments were carried out at the Appleton Estate to produce a type of rum that would serve as a substitute. Different rums from assorted barrels of varying age and type, were blended together and the result was "Appleton Estate Special Rum". This new rum was much smoother, lighter and more fragrant than other available rums and such became very popular. It is usually of golden colour with flavors and scent including vanilla, coffee, coconut and hazelnut. It is specially aged in oak barrels and is perfect with fruit juices, colas, tonics, coladas and daiquiris, but smooth just by itself as well. 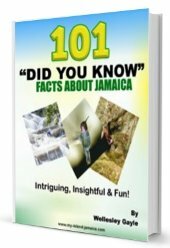 Legend has it that Appleton Rum was known as "bend down" or "ben dung" because back then it was illegal to sell in the regular bars and shops. It was however hid under counters and sold anyways due to the high demand by patrons. Appleton Special Rum ...is golden, mild and smooth. It has a mixture of fruits, spices, ginger, nutmeg and vanilla. This is the ultimate mixing rum. Appleton White Rum ... is clearer and smoother because of a special process in production. 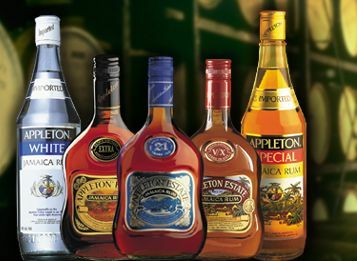 Appleton Estate Special Rum ... is a combination of different rums from assorted barrels of varying age and type. The Appleton Estate VX ...is one of the first on the Appleton line. It includes a blend of 15 different select aged rums. Appleton Estate Reserve ... is a blend of 20 select aged rums. Appleton Estate Extra 12 yr. old ...is a masterpiece of oak ageing. It has rums that are a minimum of 12 years old in it and because of its flavour profile it is perfect for sipping. Appleton Estate Master Blenders Legacy ...was created to celebrate 3 generations of blenders. It is a combination of 30 yr. old rum and was created to celebrate the art of rum making and drinking. The Appleton Estate 21 yr. old ... was literally aged for 21 years. Only a limited number of this rum is bottled and released each year. Return to Jamaican Food and Drinks from Appleton Rum.